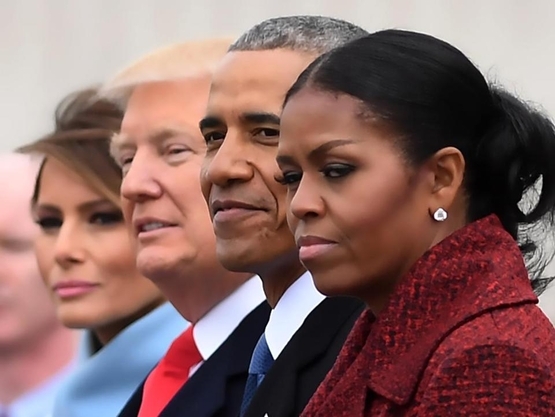 Melania Trump, Donald Trump, Barack Obama, and Michelle Obama at the US Capitol on Inauguration Day. JUST AHEAD of Donald Trump's 100-day milestone, Barack Obama stepped back into the spotlight Monday, giving his first public speech since leaving the White House. He seemed relaxed and good humored ("What's been going on while I've been gone?"). And why wouldn't he be? The John F. Kennedy Library is about to give him its annual "Profile in Courage" award, despite a singular lack of courage in his political career. A Wall Street firm has agreed to pay him $400,000 to give a speech, with other lucrative gigs lined up in Italy and Germany. Best of all, perhaps, his legacy as the 44th president of the United States appears to be in no danger from the 45th. Indeed, Trump's presidency so far is looking an awful lot like Barack Obama's third term. It's no joke: The candidate who never missed an opportunity to deride Obama's record — Trump pronounced him "a disaster" and "one of the worst presidents in the history of our country" — is compiling a presidential track record that, 100 days in, can be fairly called Obama-esque. Of course that doesn't apply to everything Trump has done. Nominating Neil Gorsuch to the Supreme Court, picking Jeff Sessions for attorney general, warmly embracing Israel's Benjamin Netanyahu, approving the Keystone XL pipeline — those could never have happened as long as Obama occupied the Oval Office. But consider all the other ways in which Obama's achievements and approach to governance remain firmly entrenched under his successor. First and most obviously, despite Trump's endlessly repeated vow to "repeal and replace the big lie, Obamacare," the Affordable Care Act is still the law of the land — and, if House Speaker Paul Ryan is right, will remain so for the foreseeable future. Obama's chief foreign policy accomplishment — the misbegotten nuclear deal with Iran — isn't going away either. As a candidate, Trump condemned it as the worst deal ever negotiated and said his "number-one priority" was to "dismantle" it. In practice, the Trump administration, far from moving to abrogate the agreement, continues to uphold it. Just this month, Secretary of State Rex Tillerson confirmed that the agreement, including the multibillion-dollar sanctions relief that Tehran reaped from the deal, remains in full force. Republicans have made much of Trump's decision to authorize a missile strike on a Syrian military base after a chemical weapons attack by the Bashar Assad regime. It's true that Obama warned Assad not to cross that "red line," and then did nothing when it was crossed. But for all the chest-thumping by Trump spokesmen and supporters about how the missiles demonstrate that "America is back," the new administration insists that the one-time gesture does not signal a change in US policy toward Syria. Not that anyone seems clear on what that policy is: On the one hand, Trump — like Obama — has suggested that Assad must be removed from power. On the other hand, Trump — like Obama — maintains that isn't the job of US troops. As for "America is back," Obama oversaw plenty of military attacks. During his first 100 days, Navy SEAL snipers killed three Somali pirates on the high seas, successfully rescuing an American sea captain who had been taken hostage. Obama approved US military action to overthrow Libyan ruler Moammar Khadafy. He ordered the raid that killed Osama Bin Laden. He expanded the drone war against radical Islamists far beyond anything George W. Bush ever approved. He even told his aides at one point, in words easy to imagine being spoken by Trump: "I'm really good at killing people." In almost every policy area, Trump isn't unwinding Obama's record, but extending it. Trump repeatedly said during the campaign that he would label China a "currency manipulator" on Day 1, reversing the Obama policy. Instead he has reversed his own promise and will continue to follow Obama's lead. Before the election, Trump said he would "most likely replace" Fed chairman Janet Yellen, an Obama appointee who "should be ashamed" of what she had done to the country. Now Trump talks about how much respect he has for Yellen and says he may well reappoint her to another term as chairman. Trump used to deride the Export-Import Bank as corporate-welfare "featherbedding," and promised to scrap it. No longer: Trump's view now is that America needs the Ex-Im Bank. That was Obama's view, too. NATO? As a candidate, Trump alarmed US defense allies with his talk of NATO being "obsolete." As president, he has turned 180 degrees, and now assures those allies that they are obsolete no longer. In numerous ways large and small, Donald Trump's presidency has been a continuation of his predecessor's. Immigration? Under Obama, the militarization of the US-Mexico border and the removal of undocumented immigrants reached unprecedented levels — so much so that immigration advocates bitterly referred to him as "deporter in chief." Nothing would please Trump more, we can safely assume, than to now claim that title for himself. Government spending? Obama signed legislation massively increasing government outlays on "shovel-ready" infrastructure projects. Trump is gearing up to spend even more money on the same thing. Nor is it only with regard to government policy that Trump seems determined to follow in Obama's footsteps. 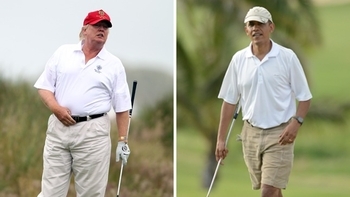 For years, Trump berated Obama for all the golf he played; when he became president, Trump assured voters, "I'm not going to have time to go play golf." Since the inauguration, CNN reported on April 9, Trump has found time for at least 16 golf outings. Barack Obama may no longer be president, but the Obama presidency goes on.